The Review: This was my first book by author Kresley Cole and honestly she couldn't have done it any better. She had me compelled from the very first page with her amazing talent for storytelling and also for her intense and incredible scenes. 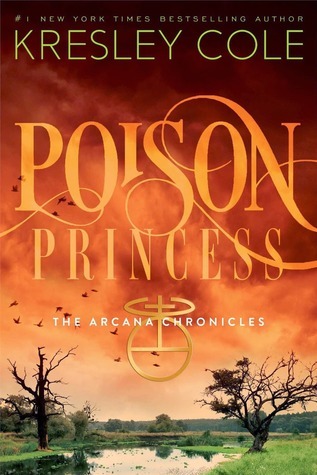 It's safe to say, Poison Princess is a gripping page turner! This story follows the life of teenager Evangeline 'Evie' Greene. She's a popular girl, with a loving boyfriend and awesome friends, but even though her life appears to be normal, it's anything but. Evie experiences hallucinations but mostly they are disturbing and horrifying. Not only that but Evie also gets visions of people that she's never met and they come with warnings. But soon it's to late for Evie to figure these warnings out because her hometown - including the rest of the world has been hit by an apocalyptic event called 'The Flash' where most people are wiped out. Evie is among the survivors and soon enough she finds out that the one person she hates is alive - Jackson. Evie needs answers about her visions and decides she needs to travel to see her grandmother - who she thinks is still alive. Jackson agrees to protect Evie on her mission but as her visions get worse, she soon comes across other people who have been having the same call, and she realizes she is not the only who is meant to play out their destiny. Let me tell you right now, this book is so unique! Twenty-two teens who all have special abilities based on their characteristics of their Tarot card so they can play their part in an ancient game made by the Gods and Goddesses. Honestly, I've not read anything like this book before and I'm still in awe with how brilliant it really is. Evie is a strong protagonist - one I instantly loved. She has the weight of the world on her shoulders and still she tries to remain upbeat, happy and generally tries to stay sane. Even after the flash, she tries to remain the same even though as Jackson points out on a number of occasions, she can't hunt, start fires or protect herself - but you know there's something bubbling under the surface of Evie and it's just waiting to be unleashed. At time's my heart broke for her because whatever is happening to her, she has no control over and at times it is very scary. I'm glad she had a person like Jackson to lean on because without him, I think she would have struggled. Now Jackson, oh gosh, he's a complete bayou boy through and through. However, he can be so harsh and mean sometimes and yes, he does do stupid things but really, you can overlook everything because he's a total sweetheart at heart. It was pretty clear from the start that he was attracted to Evie - despite how he acts and even in the end, he'll always go to her. Their relationship is pretty intense and I was just waiting for something to happen. Then, that ending comes in and no sooner than you started....it's all finished...I could have cried. This book is simply unputdownable and I couldn't stop reading until I knew the how the book would end and it was absolutely breath-taking and heart-breaking all at the same time! Overall, Kresley Cole has leaped into the YA market by a storm and it's left me wanting more of her work.